The Henry Button Archive is now online! Explore the history of the Oliver Prior Society through the ephemera collection of Henry Button, a former student of Oliver Prior and member of the Society. Henry Button was an undergraduate at Cambridge in the 1930s. After a career in Whitehall, he attended Oliver Prior Society Meetings from the 1970s until the 1990s. He kept careful records of meetings, collecting programmes and letters which chart the Society’s development over more than thirty years. 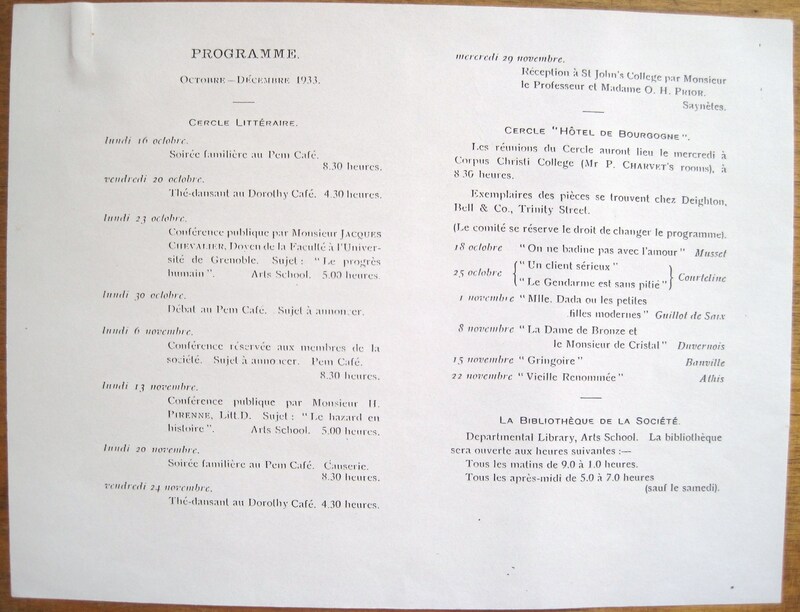 The Henry Button Archive also contains items relating to other language societies in Cambridge, including programmes for meetings of La Société Française de l’Université de Cambridge dating to the 1930s. Visit the Archive section of the website to read more.